Stunning one-of-a-kind Star Wars artwork! Paper print presents Darth Vader and his frightening power. Limited edition of only 150 hand-numbered pieces. "Stunning" is just one of the many kudos one could use to describe this one-of-a-kind Star Wars Conquering Shadow by Raymond Swanland Paper Giclee Art Print from Acme Archives. 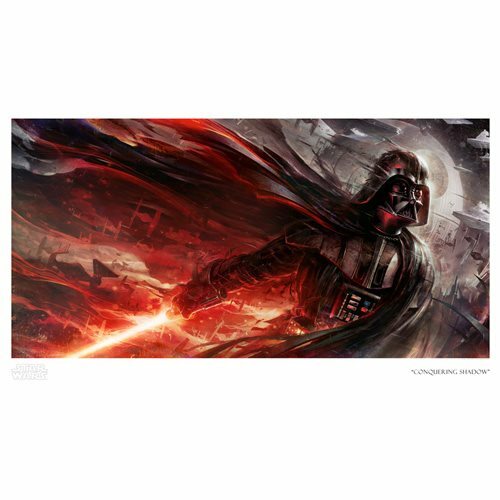 The unframed Star Wars-inspired artwork featuring Darth Vader and his frightening power is a limited edition of only 150 hand-numbered pieces that measures 22-inches wide x 17-inches tall (image size 21-inches wide x 10 1/2-inches tall) and comes with a certificate of authenticity.